Again thanks to the creative efforts of DarkRyda and TenaciousMojo, new versions of Battle of Britain and Market Garden are now running on TPU. The new Market Garden includes planes for the Axis, a bomber for the Allies, more AA emplacements, more variety in tanks and planes and a few cars. The new Battle of Britain has some major tweaks to the ticket countdown for the Allies: destroying the factory doesn't count down as fast and the radar stations respawn (at different rates). 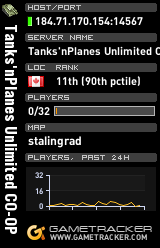 Also there's more variety in planes and a few tanks.